Growing up in Cuttack, I always have taken pride in being a Cuttakia and believed that I knew everything there was to know about the historic Bali Jatra, a festival so special to this city. As children, we looked forward to the annual Jatra all year long. This festival took place about two kilometers away from my parent’s home where I spent the first thirty years of my life. Except for the few years I was away at college, I had unfailingly relished every aspect of the inimitable Bali Jatra… However, having lived abroad for the last several decades I was taken by surprise when I visited the Bali Jatra last year. Bali Jatra is no longer just a celebration for the city of Cuttack, but it has also taken a Pan-Indian form, with a grander, more magnificent display of wealth and resources. It has become an extravaganza of art, culture, technology, and the ubiquitous presence /signature of Bollywood, making the festival more dramatic and colourful. The confluence of the village artisans, especially women, and modern technology offers a happy cross-section of traditional and modern India. Bali Jatra, the biggest festival of Odisha, is a three-day-long celebration on the banks of Mahanadi, starting on Kartika Purnima, which marks the closure of Kartika, the Hindu’s holiest month of the lunar year. The landmark Jatra marks the beginning of winter. The full moon day of the Kartika month is observed as a remembrance of Odisha’s glory of its erstwhile maritime traditions. Today, the glory of ancient Odisha is symbolized as the festival of sailboats with lighted lamps. People sail boitas (boats) traditionally made out of banana bark, and now, many new varieties made-up of plastic, papier-mâché and cardboard papers etc., in the sea, river or in pond with flowers and lighted lamps. In the ancient times, Odisha, then known as Utkal, was known for a flourishing maritime trade. The sadhabas (maritime traders) used to sail off to distant Indonesian archipelagos (Java, Sumatra, Borneo and Bali) for trade and cultural exchange in boitas. They chose the Kartika Purnima, an auspicious day, for starting their onward voyages. Then the sadhaba bohus (wives and womenfolk of the sadhabas) gathered on the seashore to bid their husbands farewell, for a safe and successful voyage. They used to sing “Aa-Ka-Ma-Bai”, which is the abbreviation of the four lunar months (Aa for the month Aswina, Ka for Kartika, Ma for Margasira and Bai for Baisakah) and signifies that those months were safe for sea voyage. The river bank reverberated with the sounds from the sankha (conch), ghanta (bell), hulahuli (ululation) and lights from dipa (lamp). The maritime trade by the sadhabas is now a memory. But the past tradition is still alive in a symbolic form as Boita bandana utshava. After an early morning bath on the Kartika Purnima, people of all ages gather to sail miniature replicas of boitas made of banana barks or solo (pith) in nearby rivers, ponds or water bodies. They fill the boitas with a little grain, betel leaves, and nuts, which are symbolic of merchandise, and a tiny oil/ghee lamp as a nostalgic reminder of ancient tradition, uttering the limerick “Aa, Ka, Ma, Bai. Pana gua thoi. Pana gua tora. Masaka dharma mora,” which literally means: dear mother river, come and accept my betel and betel nut and bestow me with the good deeds of the auspicious Kartik month. Then, they are joined by the womenfolk, who break their Kartika brata, or fasting ritual. I had the pleasure of participating in this festival in 2017 and 2018 and revelled in the spectacular site when the pond in front of my house was illuminated with the lights from the tiny lamps in these miniature boats. As I watched the glow from the lamps in the boat recede into the horizon, I could only imagine what it must have been like when the massive fleet of exquisitely decorated ships laden with grains, artefacts, and textiles were bid a proud bon voyage to trade products of Utkala for the exotic goods from faraway lands. While growing up in Cuttack, my experience of the boita bandana ritual entailed waking up at the crack of dawn, walking to the river, Mahanadi, to take a dip before dawn, offer betel nut on a betel leaf in a boat made up of plantain bark, and set sail in the water making a wish to the river divine for a prosperous year. ri. We then make a beeline to have a darsan of Lord Siva at Gadgadia Ghat. By evening, we were ready to go to the Bali Jatra, maneuvering ourselves through the sea of people under the strict vigilance of an elder, buying all sorts of earthenware toys (plastic was non-existent), eating famous thunka Puri (a giant puff bread made up of white flour, straight coming out of hot oil) with Chenna tarkari, (paneer in a gravy), riding the merry-go-rounds and hand-drawn ferris wheels, and finally, ending the evening with pink cotton candy as we wait for hours to find a cycle-rickshaw to bring us home. Today, the Jatra has physically expanded from the upper ground of Barabati Fort to the sandy banks of Mahanadi, stretching over about ten kilometers of the coast of Mahanadi. The Jatra ground is marked by a massive gate crowning a boita, (the replica of a ship that the traders used to sail to trade in faraway places like Java, Sumatra, and surrounding islands). Boita bandana continues to be a symbolic worship of the sailboat, reminiscent of maritime trade, that once flourished in the state of Odisha. The traditional three-day-long Jatra has been extended to ten days of celebration. because it is virtually impossible to cover the entire Jatra in one day. The festival stretches from the upper to lower grounds with thousands of stalls. The number of stalls has also increased, with a wider range of traditional household goods being sold, such as spices, dry fish, brooms, cups, garments, and textiles. These goods are not just produced in Odisha, but now are produced all over India. One can buy various types of modern gadgets, small or large, such as telephones, a wide variety of toys, bikes, motorbikes, and cars. Even innovative and cutting-edge gadgets are launched, while Ollywood films and television programs are also inaugurated on the Jatra ground. 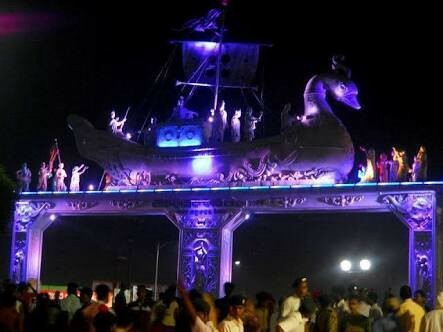 The Bali Jatra festival has become a grand celebration which attracts people from all over Odisha. The major attraction is the panoramic, open ground where the night never stops, and nobody sleeps under the star-studded sky. With better transportation facilities people from all over Odisha come together to celebrate the Jatra and participate in the festival. Now travel between states has become much easier, so, it is common to see vendors from nearby states, such as West Bengal, and from farther states, like Uttar Pradesh, Rajasthan, and Gujarat. Food is a major attraction at the festival and represents different parts of Odisha as well as of India. Innovative dishes are a big hit among the Bali Jatra visitors. Thunka puri, which was a popular food item when I was growing up, is still part of the Jatra menu, but many novel dishes have been added as well. Traditional dishes, like thunka puri, dahi bara-aloo dum (fried lentil balls dipped in yogurt with mouthwatering potato curry) and mudhi mutton (puffed rice with mutton curry, a cuisine from the city of Baripada, Mayurbhanj) are still popular, but people are also keen on paying top prices to try new dishes. Pineapple chicken, mushroom chili roti, bamboo chicken (chicken roasted in a piece of bamboo stem on the stove) and fried ice cream (cashew paste and cornflakes cooked with the ice-cream), are very popular. Families, and especially young people, come to the Jatra to try trendy snack-food like kababs, pastries, noodles and fried ice-creams, which satisfy both vegetarian and non-vegetarian palettes. Along with textile and all kinds of state-specialized garments, the Jatra is also famous for its exhibition of handicrafts from all over India. Dishes and cooking utensils, including pots and pans, are very popular to showcase and sell. Today, people are reverting to historical preferences for earthen pots and pans, which promote better health. The earthenware dolls from my time are no longer a major attraction and are now have been replaced with more modern toys which no more promote environmental awareness. Many women’s self-help groups (SHGs) have produced beautiful toys, such as dolls, kites, pen-stands, photo-frames, and flower-pots, among other household necessities manufactured from used paper. Products like toys, brooms, mats, etc. are made of Sabai grass, which grows in the hill tracts of Kandhamal, has become another major attraction. Women from this region come to display their creations and are seen working on site to transform the Sabai grass to beautiful artefacts, turning unwanted waste to useful products. Many artisans, specializing in household products, come from far and wide and join the festival to showcase their handicrafts and handlooms. The artisans get the rare opportunity to display their beautiful creations in different stalls. This year, Tirumalla Saha, from Assam, has showcased vanity bags made with bamboo, a popular item at the fair. Odias find it very surprising that bamboo can produce beautiful creations, other than floor mats. As I surveyed the multitude of merchants from the different parts of India hustling to sell their wares and the enthusiasm of the crowd during my last visit to the Bali Jatra, I couldn’t help thinking how the state is promoting Balijatra — to help thrive centuries-old tradition — the grand exchange of goods from distant destinations, the thriving excitement of throngs of crowds jostling to try new things, only different destinations and a different time. Cultural programs are also major attractions in the Bali Jatra. The state sponsors Odissi, and several folk dances and types of music from every corner of Odisha. Every evening, cultural activities are packed with performances by well-known artists from the state, as well as across India. Even Indonesian dancers came to perform at the festival this year, as part of a state cultural exchange program. This year, I learned that the Jatra not only reflects but also refracts our culture. For example, hijras are given a special spot to showcase their talent as well as their leadership. A stall, completely manned by the twelve hijras, also known as Kinnars, has been introduced since last year. They produce many beautiful materials, like incense sticks, scented soaps, and herbal products, among other things that have been attracting huge numbers of customers to their stall. Their goods range from twenty to two hundred Rupees, and their beautiful attire and positive spirit have made them showstoppers this year. Different nonprofit organizations (NGOs), socially responsive corporations, and Self Help Groups (SHG) are also spreading their message. This year, an awareness camps for Women’s empowerment has been installed, educating people about gender sensitization, women’s education, and economic empowerment. They are offering information on how to report violence, sexual abuse, dowry and any sort of injustice against women, and this is very popular among the visitors. 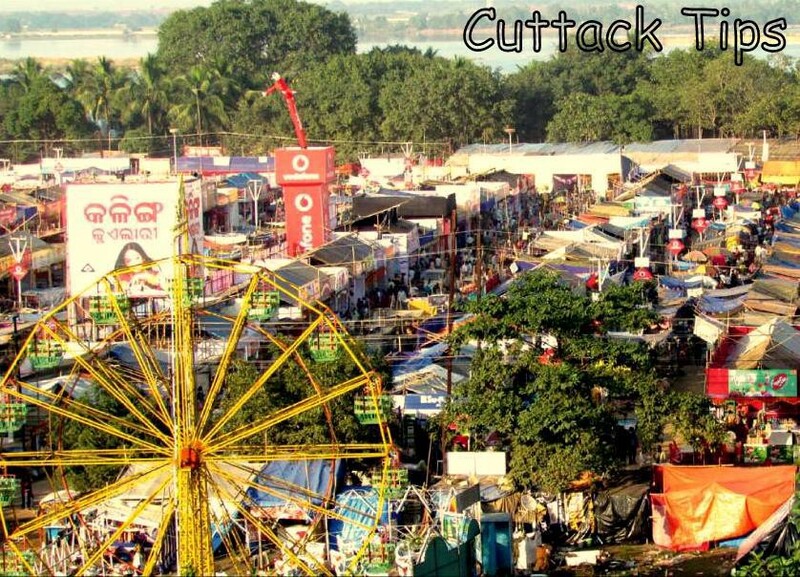 Cuttack, the ancient capital of Odisha, is known for its historical glory, fame, and rich cultural heritage. Since 1949, Bhubaneswar has become the new capital of the state and most administrative offices have moved there. Now, all the state’s developments are taking place in Bhubaneswar, leaving Cuttack deserted and forlorn. Even though it is known for having the oldest medical university in the state, major private hospitals have opened up in the capital city. There has been a paradigm shift between Cuttack and Bhubaneswar. In the Middle Ages, trade was quite common, and all the maritime trade started from the banks of Mahanadi river. Cuttack still has the Barabati Fort symbolizing the power and glory it once had. Since India’s independence, the state’s identity, prosperity and progress is tied to Bhubaneswar. It is not a surprise that since last year, Bhubaneswar also has started Bali Jatra, on the banks of the Kuakhai river, a branch of Mahanadi. Still, the extraordinary extravaganza of art, culture, and heritage demonstrated at the Bali Jatra defines the uniqueness of Cuttack and the state of Odisha. Bali Jatra has only become more dramatic and colourful with today’s use of technology and social media. Participating in this year’s Jatra reminded me of writer, artist and philosopher Makato Fujiama’s work Culture Care, in which he says that there has been a great effort in many societies that have endured many ruptures to restore and heal their culture to ‘come back beautiful, vulnerable and whole in their broken places’. Bali Jatra celebrations connect different pieces of Odia past and showcase Odisha’s achievement in the present.